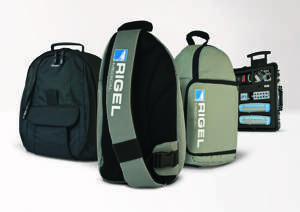 A new range of lightweight carry cases and back packs for the easy and convenient transportation of medical device analysers and simulators from site-to-site are available from Rigel Medical. A sling-style, water repellent carry case is available for the Rigel 288 electrical safety analysers and the combination vital sign simulator UNI-SIM. It can be quickly configured to hold several items of test equipment and accessories such as a label/results printer and a barcode scanner. The new back pack-style Med-ePack can be configured to accommodate up to five items of electrical safety, vital signs simulator, ventilator test equipment to provide an easy-to-carry, lightweight and versatile test solutions package. There’s also space for a laptop and asset management software. Also available as part of the range is the Med-eKit trolley case-based biomed field service kit used for the rapid testing of electrical safety and operation of medical devices and equipment used in hospitals, operating theatres and other facilities. The Rigel Field Service Kit can be customised to hold up to two individual testers – the Rigel 288 and UniSIM – as well as a label and results printer, barcode scanner and PC software. Visit the Med-ePack product page for more information.